If you picture sandpaper as a sheet with mini-wood cutters glued to the surface, you begin to understand why it’s important to use sandpaper carefully. The following wood sanding tips will help you preserve the value of the wood you are working with. Using a block makes it easier to sand an area without gouging it. Rubber sanding blocks are available at the hardware store, but any wood block can do as well. Just sand all the edges of the block so they are slightly beveled. 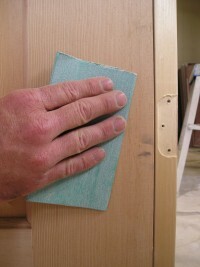 As you are sanding, refold or shift the sandpaper on the block frequently. This will expose fresh cutting surfaces. Vacuum or brush away the dust as you sand. A flannel cloth works very well to trap fine sawdust on the wood surface as well. A paint brush works well to whisk away dust particles that collect on the sandpaper. A combination of all these techniques will keep the dust from loading the sandpaper and reducing its effectiveness. When the sandpaper is no longer cutting the surface effectively, discard it and get a new piece. You can tell when the sandpaper is losing its bite in two ways. It takes more effort to get results. And the sandpaper won’t feel as rough to your fingers. Sanding wood can take considerable effort, new sandpaper is inexpensive compared to your time and energy. Use long even strokes, over lapping each stroke slightly. Press lightly, avoiding any tendency to dig in at the end or beginning of the stroke. This is especially important if you are using a belt sander. Let the weight of the sander and the sandpaper do the work. Patience will pay off. Before you switch to using a finer grit, vacuum the surface. Or use a soft, dry cloth such as flannel or cheese cloth. This removes the dust and any abrasives that have come loose from the previous sanding. Always sand with the grain never across the grain. Sanding across the grain tends to gauge the wood as the fibers are more vulnerable from side to side. The fibers aren’t as compact around the tree. Wood sanding is a very important process when dealing with wood. Mastering the proper techniques will help you enjoy the beauty of your wood project for years to come.